Was there a point to this book? Maybe, but I had a really hard time finding it. I felt bad, because I LOVE Witch Child and Sorceress by this same author but the entire first part of this book is about conspiracies, and then it seemed that the last part just focused on Sovay herself. 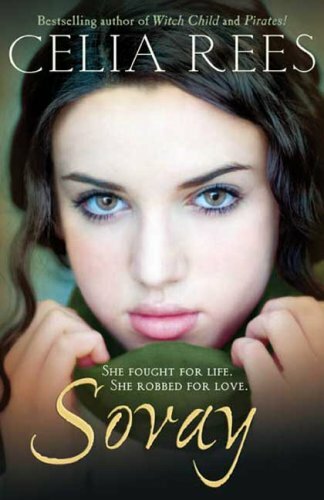 Plus Sovay had A TON of love interests. At first I thought, "Ooh. Love triangle." But then it turned into a love square, then a love hexagon, then it jumped to an octagon! And finally she picked a guy I DID NOT like, and I didn't understand why she liked him. Okay. Now that you've read my review, you can read this summary. I usually don't like to post summaries (as most of you probably know) because I'm afraid they bore people, but I'll include one here so you can have some idea of the book I just reviewed, there's a bit more review after it. England, 1783. When the rich and beautiful Sovay isn't sitting for portraits, she's donning a man's cloak and robbing travelers in broad daylight. But in a time when political allegiances between France and England are strained, a rogue bandit is not the only thing travelers fear. Spies abound, and rumors of sedition can quickly lead to disappearances. So when Sovay lifts the wallet of one of England's most powerful and dangerous men, it's not just her own identity she must hide, but that of her father. A dazzling historical saga in which the roles of thieves and gentry, good and bad, and men and women are interchanged to riveting effect. So you'd think it was about her being a bandit, right? No! It's all about her trying to escape this corrupt government. Anyway, it's not a book I'd recommend. It's not "bad" it's just pointless. I completely agree. This book was just all over the place. Thanks for the honest review. I haven't heard anything good about the authors other books either. A lot of people on Shelfari said Witch Child was extremely boring. Grr, thinking of this book makes me annoyed because it was so...unlike Ms. Rees' other books. I really liked Witch Child (Sorceress was okay, too) and Pirates!, but this was so RAMBLING. And pointless. And it did NOT live up to the cover, either. The summary sounds interesting...but it sounds like it ended up being a drag. I have read a few reviews of this and decided to give it a miss as it didn't soound great. I wasn't that into Witch Child but I did like Sorceress. I can't stand pointless books. And when it turns into, as you said, a love octagon, it gets really confusing and just plain painful to read. i saw that in chapters, read the inside flap, and said, "no, thanks!" it didn't sound interesting to me.